It was some time ago that a fellow reviewer suggested I might enjoy The Night Circus. The reason it took me so long to read it was that somewhere I came across a review or description of the novel which used the term “magical realism”. The only books I have knowingly read in that genre were at university, and I didn’t get on with them very well. 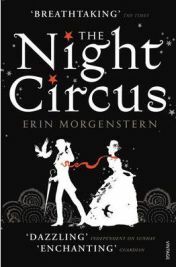 Erin Morgenstern’s The Night Circus is about a mysterious circus which seems to arrive out of nowhere and opens at dusk. Full of fantastic shows and experiences, visitors are captivated by it. The novel has two timelines in it, the present being 1902 and the past being over the course of several years in the late nineteenth century which eventually joins with the present. It follows the inception of the circus and its success, while the present is about a boy named Bailey who lives for when the circus is in town. The two timelines are not confusing, but they do seem to be quite intertwined, even at the start when they are quite far apart in time and events. It’s easy to forget that Bailey’s experiences of the circus are coming quite a while after what we read about in the sections about the past. While I enjoyed the story and style of The Night Circus right from the start, it took a while for me to really want to keep reading. I kept reading because it wasn’t a bad novel at all, but it wasn’t until at least halfway through the novel that I actually wanted to find out what was going on, to such an extent that I took a break from The Night Circus to reread The Lord of the Rings in full. However, once it got its hooks into me, it became a real page-turner. There was so much that had to be explained, and so many things to be resolved. As it turned out, I’m not certain that everything was explained fully, as I don’t think I could recount it here, but the novel came to an acceptable conclusion, and even had what could be called a happy ending. The writing of The Night Circus is very good, but where Morgenstern really excels is in her descriptions of the circus itself. For all that it is a mysterious and fantastic place, her descriptions are so evocative that you really can build a picture of the circus, and almost feel you can smell the food stalls, hear the amazement of the crowds, and picture all the magical exhibits they see. Saying that, my favourite has to be one of the most simple – the young twins whose parents are the big cat tamers run a small sideshow doing the same as their parents but with kittens. I thought that was a wonderful detail, and I’d love to see a film of The Night Circus just for that. If The The Night Circus is magical realism, then it turns out I do like it – but perhaps that shouldn’t surprise me given how much I enjoy supernatural novels set in the real world. It may have taken a while to get going, but once it did I was hooked. One Comment on "The Night Circus"
Ok. Thanks to your review i think it might be time to tackle Night Circus. I’ve shied away for exactly the same reason. I’m not sure if ” magical realism” is my thing, but there’s only one way to find out.